With Direct Ferries you can find a Ferry to Gdansk and quickly and easily compare with other sailings to Poland or neighbouring countries to ensure you book the best crossing available. Using our fare search you can check timetables, live prices and availability for Ferries to Gdansk, or compare your destination with alternative ports, not just in Poland, but further afield too. 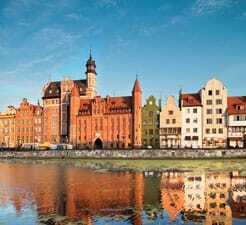 It really is simple to save on your ferry to Gdansk with directferries.co.uk. All you have to do is select your place of departure, ferry route, number of people travelling on the ferry to Gdansk and hit the search button.